An elephant with big ears becomes an outcast at the circus, but the very thing that made him an outcast may have the potential to make him a star. "Dumbo" is a movie that not only you and your parents may have watched growing up, but it's also a film your grandparents probably watched growing up, too. 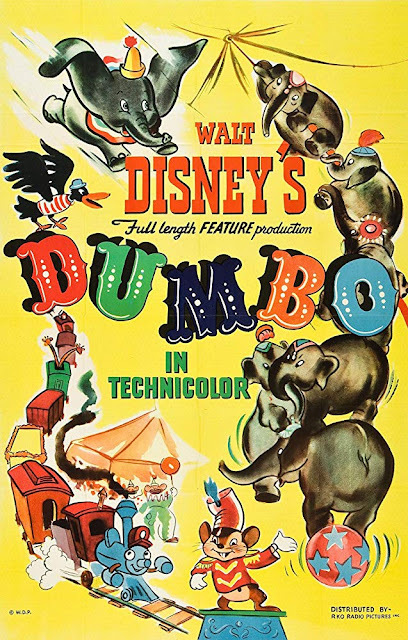 "Dumbo" is a 1941 animated film from Walt Disney. At only 64 minutes in length, it is one of Disney's shortest theatrically released movies that can be considered feature length. Weirdly enough, despite its length, it has seven directors and eight writers and is based on a roll-a-book written by Helen Aberson and Harold Pearl. It tells the story a little elephant named Jumbo Jr. Jumbo Jr. is ridiculed by the other animals at the circus due to his big ears, and he even gets the nickname Dumbo by those who mock him. When little Dumbo gets picked on by some kids one night, his mother gets angry and attacks the bullying crowd. Because of this incident, she is locked into isolation and dubbed a "mad elephant." Dumbo is eventually turned into a clown, but he will soon discover what once held him down may help him soar to new heights. In more recent years, it has been pointed out how dated "Dumbo" is. Truthfully, many of Disney's older titles have elements that many consider racist. Here, it's the character Jim Crow and his buddies. It's hard to argue otherwise (especially since his name is literally Jim Crow), but it's interesting to note that these characters are some of the nicest Dumbo encounters. Apart from this very unfortunate inclusion, there is a positive message to be gained from this film as it takes a look at bullying, and shows how cruel people can be to those with physical differences. It's a story similar to that of "The Ugly Duckling" and "Rudolph the Red-Nosed Reindeer" where a one-time outcast grows up to be the object of much envy from their former naysayers because his "deformity" is what makes him unique. Despite its somewhat derivative nature, "Dumbo" is still a charming film full of memorable music, heavy emotion, and silly fun. Many of the songs have survived through the decades and are still listened to today and played today, including "Baby Mine" (which still makes us tear up to this day), "When I See an Elephant Fly," and "Pink Elephants on Parade." Speaking of the "Pink Elephants on Parade," Disney certainly created a remarkable sequence to go along with that song. Sure, it's a creepy, nightmare-inducing fever-dream type of scene, but it is one of the most creative and beautifully psychedelic animated sequences Disney created for that era. As with all of the older Disney films, it boasts 2D hand-drawn animation, which we love. More of this, please!! "Dumbo" may be dated in many aspects, but it's still (mostly) watchable today. At just barely over an hour, you'll hardly even realize you've pressed play. We don't have the same affinity for this feature that we do for some of Disney's other older classics ("Peter Pan" from 1953, "101 Dalmatians" from 1961, and of course, anything from the Disney Renaissance), but it's still a great watch.